It is being hailed as the new age of disruption. What has been valid in the past doesn’t hold good for future. Reach to information and technology have erased what were the earlier notions of scale, industry or geographical boundaries. Formal structures have given way to informal networks. The old principles are being obliterated or overwritten in what is increasingly a uncertain age. The one truth is that everyone gets disrupted; it is just a matter of when. How can one be ahead of this or ride the waves of change as they happen? Disruption is pervasive and no industry is an exception. Digitisation, automation, machine learning and artificial intelligence are expanding human capabilities. New technologies are creating unforeseen opportunities and threats too. Keeping up with these new dynamics of production, transaction and business models is a challenge; a learning curve for the business leaders. Leadership in the age of disruption demands radical shift in thought, action and outcome. If a company does not disrupt the industry first, it is likely to get disrupted by another. 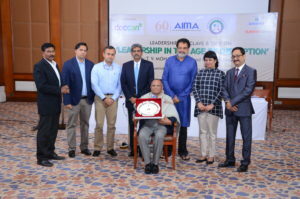 Goa Management Association organised a talk on Leadership in the Age of Disruption on 18 December 2017, at Goa Marriot Resort, with the following luminaries speaking on the topic. 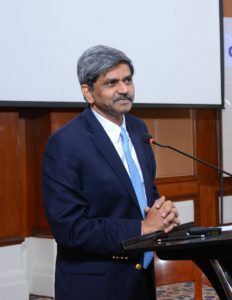 Introducing the topic, Mr. Shrinivas V Dempo, Chairman, Dempo Group of Companies, AIMA Council Member and Past President, Goa Management Association, elucidated the younger generation’s comfort with technology, the pace of change and the corresponding expectations. Giving examples of digital marketing, he said old paradigms are being rewritten. 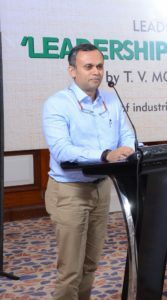 While he expressed that manufacturing industry is a backbone to economy, he cautioned that they have to get out of the brick and mortar mindset and adapt technological changes. He expressed his pleasure at being able to reconnect with GMA. Addressing the topic first, Mr D Shivakumar, Chairman, Pepsi Holdings, and Past President, All India Management Association, gave a quick fire snapshot of the issues emerging out of disruptive changes. He mentioned that only 60 companies have remained on the Fortune 500 list over the years. He indicated that life span of organisations and CEOs is shortening, while human lifespan is increasing. He threw light on the challenges, the need to transform and the 5Ts of Trends, Talent, Technology, Time and Top management, which are the key to survival in the times of disruption. He expressed his pleasure at being in Goa and speaking to GMA for the third time. 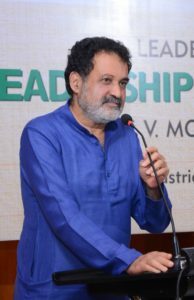 Following up on the above, speaking in the end, Mr T V Mohandas Pai, President, All India Management Association and Chairperson, Manipal Global Education Services Pvt Ltd., elaborated the course of history and change in the world and cautioned that while major changes in the past took 500 years to happen, recent changes have taken far shorter times to be introduced and to impact people. He elaborated on the various dimensions, and impact of these changes, of human resources, lifestyles, lifespans and other socio-cultural aspects of mobility, migration and resultant economic and physical contours. The enthusiastic crowd of over 200 people interacted with the speakers to gain insights into how businesses, jobs and lives would be impacted and what should be the outlook to survive in the age of disruption. Earlier in the evening, Mr. Narayan R Bandekar, Founder and Chairman, NRB Industries was felicitated by Goa Management Association for his exemplary contributions to the Goan industry and society, on his completion of 75 years.